Two University researchers created a windmill that can charge your cellphone battery—and it’s smaller than a grain of rice. In texas, where everything’s bigger, two engineers have opted to go small—really small—with their latest design. UT Arlington research faculty associate Smitha Rao and electrical engineering Professor J.C. Chiao have created a micro-windmill that can harvest wind energy to power things like cellphone batteries. And it’s a fourth the size of a grain of rice. Conventional wind turbines, like those sleek white structures seen spinning alongside many Texas highways, can rise several stories high. In contrast, Drs. Rao and Chiao’s invention measures less than two millimeters in diameter. The idea for the ingenious device came to Rao when she was a Ph.D. student at UT Arlington. For a project in one of Chiao’s classes, she had to come up with a new micro-electro-mechanical systems (MEMS) device. Eventually, though, she settled on the idea for tiny, energy-producing windmills. Unfortunately, after testing her creation, Rao found that the micro-windmill’s manufacturing material, silicon, was too brittle to be effective. The windmills only worked in a very small range of wind strengths before the wind would fracture the device into pieces. But an unforeseen solution presented itself a few years later, when Chiao was approached by a former college classmate who now worked for WinMEMS Technologies Co. Ltd., a Taiwanese foundry. He was seeking novel device designs and applications for the company’s unique fabrication techniques, which are known in the semiconductor industry for their reliability. What intrigued Chiao was the company’s use of nickel alloy material, so he broached the subject with his students. Rao spoke up. “She said, ‘Remember my micro-windmill idea, how it never worked out?’” Chiao recalls. “Then, we had used silicon, which is very brittle. Nickel, however, is very flexible, so we thought it might do the trick. They were right. The durability of the nickel alloy combined with a modified, more aerodynamic design allowed the windmill to operate under strong artificial winds without fracturing. Rao’s daughter inspired the latter adjustment: “I saw her playing with her pinwheels one day, and I realized I need that same curvature to make the windmill move.” So she added a series of step-like levels on the blades to make them more aerodynamic. Rao and Chiao successfully demonstrated the micro-windmill in September 2013, then revealed it to the public a few months later. The device has since garnered an incredible amount of attention, being featured in The Washington Post, Time magazine, Wired, Fast Company, Forbes.com, National Geographic, and many foreign media outlets. Online videos showing the windmill were viewed almost a quarter-million times within the first three weeks alone. Carolyn Cason, UT Arlington’s vice president for research, says she was both impressed and intrigued by the project. “The first time I saw the micro-windmill, I said, ‘Wow…but what’s it good for?’” she recalls with a chuckle. Rao admits she didn’t have a specific application in mind when she designed the device. The challenge for harnessing wind energy is that wind is not a constant weather condition. So the researchers needed to find applications that didn’t rely on constant airflow. A brainstorming session led to the most popular solution: cellphone batteries. 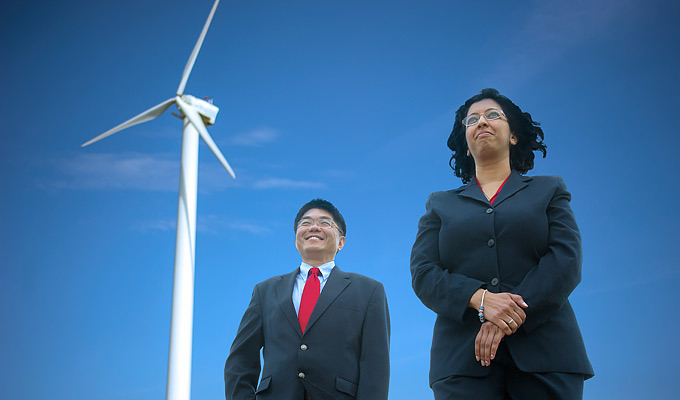 J.-C. Chiao and Smitha Rao's invention brings a new dimension to wind energy. With items like compact mobile devices, bursts of energy from the wind are able to provide enough stable power for the battery. In practice, the way it would work is that hundreds or thousands of windmills would be embedded within a device’s packaging to collect energy from the airflow in the environment. To charge their smartphones, users would simply put a sleeve onto the device, wave it in the air for a while, and then use it again. But that’s just one of the micro-windmill’s potential uses. Both Chiao and Rao believe their creation eventually could power things like wireless sensors beneath bridges, highways, or buildings that monitor environmental and structural conditions. When dealing with those compact, hard-to-reach items, solar panels and micro-windmills could prove to be a more convenient energy solution than continually replacing batteries. As an added bonus, the micro-windmills are also relatively cheap to make, since they are produced in an array using batch processes. The fabrication cost of making one device is the same as making hundreds or thousands on a single wafer, which allows for mass production of inexpensive systems. So what’s next for the micro-windmill project? Both Rao and Chiao say a lot more investigation into just what makes the devices tick—and what problems they may face. Rao knows that despite the success they’ve had with the windmill thus far, there is still much more research and experimentation to be done.